A feature that I’ve long wanted is finally here: Feed Stats. You can now monitor your feed statistics with WordPress.com. Go to the Dashboard > Feed Stats tab and there they are. There are two charts for you to examine. I’d like more specific information than just these charts, but in general, these statistics will prove interesting. Now remember, this new feature is new and subject to change and evolution. The statistics reported are also marked as estimates, so the reports might not be completely accurate, but probably close enough to help you see trends. If you would like to speak up about how they can be improved or changed, use your Administration Panel Feedback Button and let the developers know. The first chart is similar to the graph chart for blog statistics found in a neighboring tab. It lists your blog feed statistics for the past 30 days. What this means is that is counts how many times your feed links for your blog are “visited” by users reading your blog feeds. Two things are not shown in this chart and information. One is how many of these people actually clicked on a feed link and visited your WordPress.com blog. Also, it doesn’t show how many people subscribe to your feed. Services like Feedburner count each subscriber to your feed through their service. Feedburner allows me to showcase this information such as in the Feedburner link in my sidebar here. If they are using a service which reports how many people are subscribed to your blog, then you can get that information, but if they are using a web browser feed reader, then there is no way to know. You can only guess based on the average number of feeds over a long period of time. 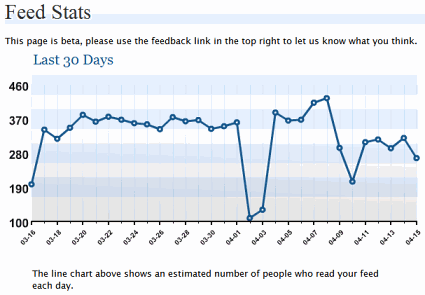 Because of this fact, I’d like to see the chart track 60 or 90 days, both in the blog and feed statistics. Long term measurements often help more than 30 day counts. So the above chart offers statistics showing you how many people are actually using the feed link, like monitoring how many people are visiting a specific post or web page on your site, except you don’t know what they are looking at, just that they are looking at your feed. This is good information on tracking usage and popularity of feeds. The second chart reports on the number of users using a specific feed tool to monitor and read your feed. This is a little more interesting. 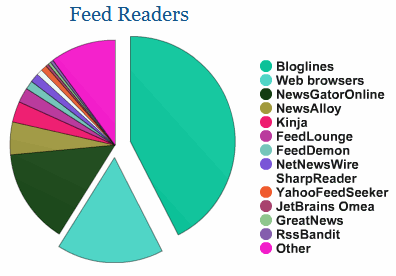 On my pie chart, it shows that the majority of users of feeds through their services are accessing through Bloglines. A slightly smaller majority are using their web browser, possibly using something like Firefox’s Sage feed reader or another integrated web browser feed reader. A surprising number of users are still using NewsGatorOnline, a service that’s been around for a while. Nice to see it still active with all the new feed reader competition. If you hold your mouse over the pie chart, it will show you, like it also does with the bar chart, the percentage number of users representative of that feed reader from among all the feed readers visiting your blog. Warning: When revisiting the pie chart of feed readers, do not memorize a color and associate it with a specific feed reader. As of right now, the colors change so one time Bloglines will be light blue, the next brown, and who knows what next. I’ve asked the developers to keep the colors consistent so we can glance at the chart and think, “Ah, I’m getting a lot of hits from Bloglines today” or “Bloglines has sure dropped off today.” Recognition by distinctive color not fine print is critical to the success of such charts. The blog statistics tell you how many people are actually visiting one or more pages on your blog. It also tells you which posts are the most popular and where the people are coming from. There is also information on which search terms get people to your website. All helpful information used to keep you informed and guide you, if you care, in what topics people are mostly interested in, and what you should be blogging about. Feed statistics give you less information but it does help you understand how people are accessing your blog. Expect feed reader access to increase as more and more people discover their benefits. Information on the services your feed reader fans use is a little more challenging to understand without something to compare it to. For example, a specific type of people may use one service more than another, such as younger people being more drawn to XYZ feed service and older people being more attracted to using ABC feed service. Or more technically minded folks using PQR feed service, while beginning Internet users stick to the very basic 123 feed service just because it is so easy to use. If you understand the audience using those feed services, you may be able to get some insights into the personalities and characteristics of those feed visitors to your blog. Or you might not. I’m not familiar enough with the different services to give you that information, but I’m sure someone will make those connections. It also helps you learn which feed services are the most popular. Usually, this information will help you customize your feeds to meet that service’s needs, but we can’t do that with WordPress.com. But it does encourage us to check out the popular services to see how they work and how we might take advantage of their services, and, well, because so many others seem to like it. The problem with a lot of this information is the myriad ways feeds are used. They are used by people to quickly gather information and updates from their favorite websites and blogs. They are also used to display content, in various forms, on web pages, such as headlines (like the feeds shown in my sidebar using the new WordPress Widgets), excerpts, or even full content, sometimes instead of original content on a web page or blog. All we have are the statistics and feed services. Many of those feed services, such as NewsGator, allow users to showcase your blog on theirs. But how would you be able to track that information? That’s for another article. Still, information is good and this is just another piece of the puzzle that helps you understand your visitors a little better. So what do you think you will learn about your blog and your blog’s readers from this new information? This entry was written by Lorelle VanFossen and posted on April 15, 2006 at 12:58 am and filed under WordPress, WordPress News, WordPress Tips with tags how to use wordpress, wordpress, wordpress help, WordPress News, WordPress Tips, wordpress tutorials. Bookmark the permalink. Follow any comments here with the RSS feed for this post. Post a comment or leave a trackback: Trackback URL. If there are any chance that there will be a plugin for it? Jamshid: If there is enough demand, probably there will be a publicly available WordPress Pluging for feed stats. Right now, you can get feed stat information from other Administration WordPress Plugins that monitor and display statistics on full versions of WordPress. You might not get the pie chart, but you get plenty of other very helpful information, more than what you get with the blog stats on WordPress.com. Hey great blog and I used your story in one of my blogs, don’t worry I referenced you and tracked back to it! (it was on copyright). Anyways, I was wondering where you got the Technorati Profile button? Rather than “steal” it I was wanting to get one if I could… leagally. Thanks keep up the good work and I will visit often. The RSS stats are cool. Great addition to the stats. The blog submit and Technorati Profile buttons come from either their source (look through Technorati’s site) or from sources I put together in Buttons, Bows, and Badges for Your Blog, all free to use and legal. I also made my own buttons and badges when I didn’t like what there was, such as the translation badges in the sidebar. You can use those, no problem. And thanks for asking. It means a lot! Great blog. The new feed stats feature is great. .com version only? Who cares? Which means at minimum 146,000 bloggers care. Of the millions who have downloaded the full version of WordPress, they have learned that what happens with WordPress.com can spread to benefit the entire WordPress community. WordPress.com is a giant testing ground for all of WordPress. 100 is your baseline, huh? If you take the first digit of those stats (1-4 daily visitors) it would look like mine. As for the WP.com stats, I’d like to see an accurate accounting of that. Some of those 146k go to people signing up just to get an Akismet license for their personal WordPress powered sites. Maybe the WP admins could figure out how many people have more than the “Hello, World!” post to see how many true WP community bloggers we have. Ah, blagermeister, such an optimist! How do you know that some of those 146K folks are signing up for Akismet. 😉 There are thousands and thousands of WordPress.com blogs, so many I rarely repeat a visit while crawling through. I would like to see more accurate stats overall, but they are doing the best they can. You suggest in your follow-up comment that feed stats (minus the pie chart) are available already as WordPress plugins. Could you mention any by name? I can’t seem to find any that will track subscribers, views or other RSS/Atom metrics. I haven’t been able to find out if the Feed Statistics being used with WordPress.com blogs is available as a WordPress Plugin. And as a tool, well, it isn’t very good. It gives you a percentage in a pie chart that tells you where the most people are coming through for their feeds, like using a browser, Netvibes, Google, etc. Oh, and it isn’t a pie chart any more. It’s a bar graph. It is still in alpha/beta testing mode, so we expect things to dance around a bit until it settles down. Then they might release the Plugin for the public. You can find a lot of statistic WordPress Plugins on the WordPress Codex Plugins List, through the main source for WordPress Plugins, WP-Plugins.net, and Tan Tan Noodles takes a good look at monitoring feed statistics with WordPress. Lorelle, is this only available on the hosted version? If it is I’ll have to move to it. Feed Stats are no longer available for WordPress.com and for those using the identical stats page on their self-hosted WordPress blogs. They are working on developing a better way of recording feeds, but currently, there are few methods that get it “totally” right. Feedburner and FeedBlitz do an okay job, but only if you have replaced ALL of the feed references to theirs. That’s not possible in a WordPress.com blog. Thanks – I fished around a little went to AddThis. I used it to create by subscription button on the website almost by accident when I created the web. After looking at the AddThis site a little deeper, I saw that it keeps stats on who subscribed. Hey there, I believe this is a couple years after this post was written, but I’ve been recently trying to find a way to view my RSS feed stats. I’ve only been able to find my email subscriptions. It seems things are not the same as you’ve described above, do you have any updated info? Feedburner and FeedBlitz do provide stats, and you can always add those to your WordPress.com blog with links.